The Houston Texans have been red hot since losing their first three games and improved their winning streak to six matches on Sunday. 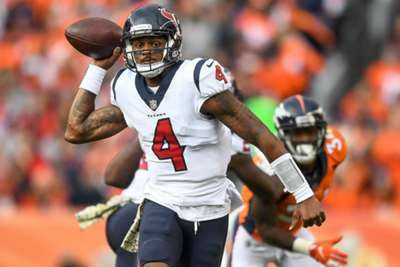 Quarterback Deshaun Watson went 17-for-24 passing for 213 yards and two touchdowns in a 19-17 victory over the Denver Broncos. He could not always get away from the Broncos' defense, however, as he was sacked four times. Watson connected with his favourite receiver DeAndre Hopkins 10 times for 105 yards and a touchdown, but it wasn't all Texans. The Broncos' third-quarter efforts gave them their first lead of the game as a 12-yard pass from quarterback Case Keenum to Jeff Heuerman put the hosting team up 17-16. However, a successful 37-yard field goal from Ka'imi Fairbairn put Houston back in the lead for good. With the win, the Texans join the 1970 New York Giants as the only teams since that year to win six consecutive games immediately following an 0-3 start. Not everyone was celebrating their kicker. The Los Angeles Chargers left plenty of points on the field against the Seattle Seahawks, with Caleb Sturgis missing two of three point-after-attempts and a 42-yard field goal. However, they still managed to pull out a 25-17 win as the Seahawks failed to engineer one of their many fourth-quarter comebacks. The Chargers have now won five straight. Cleveland Browns rookie defensive back Denzel Ward suffered a hip injury in the first quarter against the Kansas City Chiefs, and was later ruled out for the remainder of the game. Buffalo Bills tight end Charles Clay went down with a hamstring injury in the first half versus the Chicago Bears, while running back Chris Ivory was ruled out after suffering a shoulder injury. Seahawks safety Bradley McDougald worsened a knee injury he had been dealing with all week against the Chargers, and could not remain in the game. Seahawks running back Chris Carson also exited the matchup with a hip injury. Denver Broncos center Matt Paradis had never missed a snap in his career until he was carted off the field with an ankle injury and did not return. A number of Washington Redskins left the contest against the Atlanta Falcons. Guard Shawn Lauvao exited with a knee injury, guard Brandon Scherff sustained a shoulder injury and did not return while cornerback Quinton Dunbar left the game with a leg injury. With his 50-yard touchdown pass to Kareem Hunt, Kansas City Chiefs quarterback Patrick Mahomes logged his 27th career passing touchdown. He passed Kurt Warner for the most through any players' first 10 games in NFL history. Pittsburgh Steelers running back James Conner has now rushed for more than 1,000 scrimmage yards this season as he finished Sunday's win over the Baltimore Ravens with 90 yards. According to Elias Sports, he's just the second player in franchise history with 1,000 scrimmage yards through the team’s first eight games of a season. Ironically, the other player was Le’Veon Bell, who is in a prolonged holdout. He logged 1,086 yards in 2014. The New Orleans Saints scored 35 points in the first half against the Rams. It was the most New Orleans has scored in a first half under quarterback Drew Brees and coach Sean Payton. Running back Alvin Kamara helped with the new franchise record and joined Jim Brown (1958) as the only players 23 years-or-younger in NFL history with three games scoring at least three touchdowns in a single season. Buffalo Bills quarterback Nathan Peterman started a game for the fourth time, and in those contests Buffalo is 0-4. How does Peterman feel? : "I don't feel snakebit. ... I never feel like I'm a victim or anything like that, you know? It's football. It's life. Things don't always bounce your way. … You just have to be able to take it how it comes, learn from it and keep fighting forward." Carolina Panthers safety Mike Adams certainly had plenty to say after they gave up 21 unanswered points in their 42-28 win against the Tampa Bay Buccaneers: "I’m not going to feel sorry because they put up 21 points late. ... We won. There’s not going to be an asterisk by this saying, 'Oh, they scored 21 points unanswered.' No, it’s going to be a W and I'm going into Thursday looking for another win. So I'm going to just move on."